Use tilts and swings to place exact sharpness where needed with the Cambo Actus DB2 Mini View Camera. Able to create selective optical unsharpness, users gain more of the image circle of their lenses and the ability to stitch images without changing the lens position. Focus closer and enlarge your subject without extension rings, or make us of Rodenstock’s and Schneider’s best digital optics. 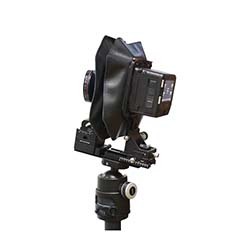 Ideal for use on location due to minimal size and weight, the Cambo Actus is a must have in your production equipment. Rent for daily and weekly pricing today! All Cambo Actus rentals require insurance to protect not only our equipment, but also the renter.